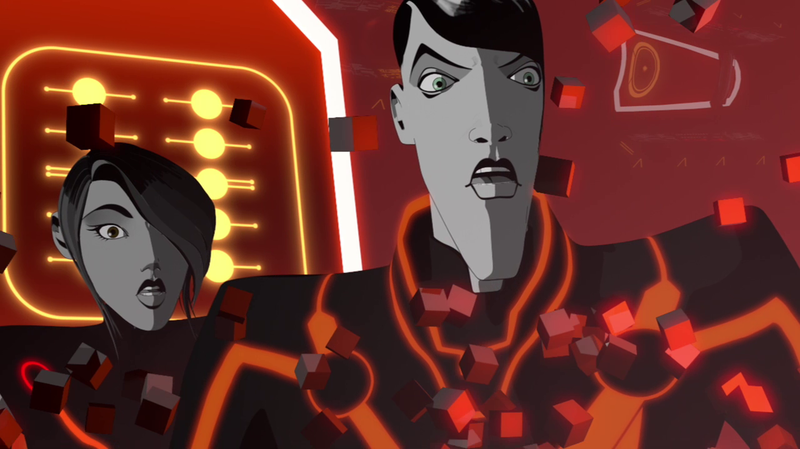 New footage for Tron: Uprising. This is already footage airing on Disney . Check it out. This isn't just for kids. Audio sync's off for me - there's about 10 seconds of black screen while the audio runs before the video starts, and then the video continues for 10 seconds after the audio ends. @_@ Really hope someone reuploads it with the sound properly synched. The trailer itself is awesome, though. This is the most psyched I've been for Uprising since the initial announcement. Looks wonderful! I love that we got some shots of familiar characters like Clu and the Blackguards to see how they translate into this format. Oh snap! Video lag be damned! It still looks ridiculously cool. The style is a bit jarring, but as a fan of another popular multi-media storyline that had wildly-different visual depictions across platforms (BIONICLE), I'm not bothered in the least. And I'm telling you, I think I see Rinzler in there. 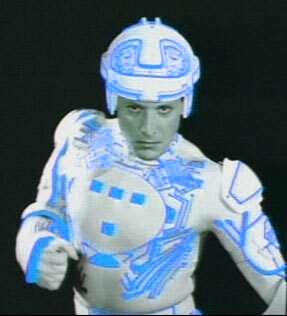 Will the epic finale be Beck (the new "Tron") face the very corrupted version of the program that trained him? Looks amazing!!!! Is that a Tron with a white suit I see? LIT Wrote:Looks amazing!!!! Is that a Tron with a white suit I see? Wicked sweet. If someone can help me figure out how to download the source video, I can make an attempt to fix the audio lag. Thanks TRON.dll, that would be great! Unfortunately, I don' t know how to get the source video. As a work around, I opened the link in two browser windows. I muted one, started it, and then started the second one about 10 seconds in, to sync the audio. It took me a few tries, but I got it close enough to see it as it was intended. HooDooMan Wrote:Thanks TRON.dll, that would be great! Unfortunately, I don' t know how to get the source video. Not an issue. Turns out I was able to use FRAPS to record the whole thing. I've attempted to sync the audio as best as I can. Stand by.. Still a little off-sync, but at the very least viewable now. Sorry about the low quality. The best programmer ENCOM ever had, and he ends up playing Space Cowboy and Fraps in some back room. You do something awesome, and you're apologizing? No problem. I'm apologizing since I captured the video at 1600x900 resolution. It should have been at at least 720p, not 240p. Ah man it looking awesome so far. Even has more Rinzler-Tron. Wicked awsome. It looks awesome! Unfortunately, I don't get Disney X D. I may have to bite the bullet and get a cable package or U-verse to get Disney X D in HD! I cant get Disney X D either. My satilite package allows you the choice of channels, but unfortunatly it doesn't include the childrens channels (because there are no children in my house), and changing it all is too lengthy & time consuming. That's why I'm going to wait until it comes out on DVD. I've just seen the latest trailer on Youtube, and I LOVED it! Is it me, or does this series just seem to keep getting better and BETTER! I think I noticed a couple things that might tie into why we never saw Tron unmasked as Rinzler. In the part of the trailer where Beck is talking to Tron (about inspiring a revolution) Tron sounds like his voice is distorted, implying to my ears that he's damaged. We also get a couple quick glimpses of what appears to be a helmeted Tron sparing with Beck. I'm thinking that they'll show Tron as being damaged in the face/head in his fight with Clu, and so he goes around masked most of the time. Just looked at it some more. It looks like Tron is already colored red just like he appears in the movie. Weird. Why would the color change if he's not "Rinzler" yet? Looking good. In fact, I'd argue it looks better than Legacy did. They've brought back some nice touches here and there, too, from the original film. Like more detailed circuitry and more varied use of color. I know we can't go back to the psychedelic landscapes of the first film, but Legacy was a bit too flat for me in that regard. Just a shame about the Aeon Flux style character design, as someone already mentioned. Not digging that aspect of it. But the rest looks pretty fantastic. cirlin Wrote:I think I noticed a couple things that might tie into why we never saw Tron unmasked as Rinzler. In the part of the trailer where Beck is talking to Tron (about inspiring a revolution) Tron sounds like his voice is distorted, implying to my ears that he's damaged. We also get a couple quick glimpses of what appears to be a helmeted Tron sparing with Beck. I'm thinking that they'll show Tron as being damaged in the face/head in his fight with Clu, and so he goes around masked most of the time. I impression I got from the trailer was that Beck was inspired by Tron instead of being trained by him (yeah, I remember the interviews were they said he was trained by him, but I'm not so sure now.) and Rinzler was sent after the new "Tron"